Eamonn Wall’s sixth book is now available. 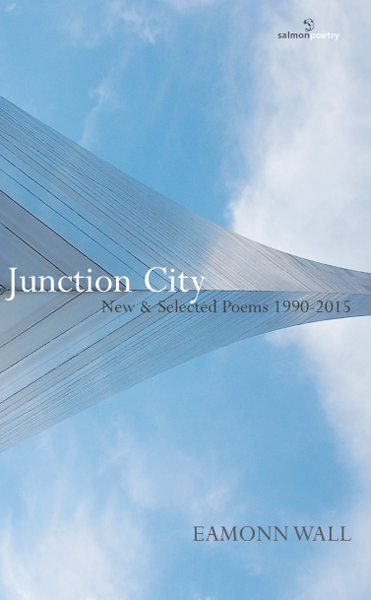 Natural Bridge is proud to celebrate the publication of Eamonn Wall’s new poetry collection, Junction City: New & Selected Poems 1990-2015. Wall is the Smurfit-Stone Corporation Professor of Irish Studies at UMSL and a three time guest editor for Natural Bridge. Above: Poet, Professor, and Natural Bridge Advisory Board Member. Ross Gay. Natural Bridge is happy to announce the success of one of our advisory board, Ross Gay. His newest poetry collection, Catalog of Unabashed Gratitude, is a finalist for the 2015 National Book Award. Červená Barva Press is pleased to announce the publication of Belly by Steven Schreiner. STEVEN SCHREINER is the author of the collection Too Soon to Leave and the chapbook Imposing Presence, and co-author with Allison Cundiff of In Short, a Memory of the Other on a Good Day. His poems have appeared in many magazines, including Poetry, Image, Colorado Review, River Styx and December, and numerous anthologies. He is the recipient of fellowships from the VCCA, Tall Rock Retreat, and The National Writers Voice of the YMCA. He teaches in the MFA Program at the University of Missouri-St. Louis and is the founding editor of Natural Bridge, a journal of contemporary literature.